Pizza, what can I add to this to make it more…absolutely nothing. Pizza is a word that conjures up taste, texture, and comfort. Pizza is the ultimate reducer of conflict, destroyer of angst and provider of happiness. A pizza a day will keep the phycologist away; if Thanos had tasted a Pizza, he wouldn’t have needed the gauntlet. Fact: Pizza is American, it was created by an Italian immigrant living in the good old USA. So, what’s the secret of a great Pizza? Everything. From the crust to the topping, a great Pizza is all about the whole process, and the final part of that process is the bake. You make the best pizza dough, have the most delicious tomato and cheese with additional toppings and still not have a pizza. Only the bake will provide you with the final product and to get a perfect bake you need a perfect oven. 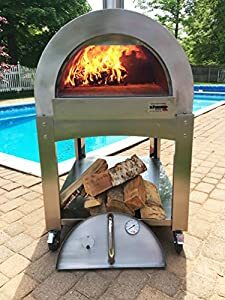 So here’s the deal, I am going to give you a review of the best outdoor pizza ovens there are. Also, if you’re a fan of outdoor cooking and love to make delicious stakes, read my review on the best campfire grills to make a right choice and do not spoil your meat in the future. Some are mobile others less so. What they all have in common is that they produce great results. What they cannot do is turn bad dough and yukkie toppings into something great. Remember, a successful pizza is about everything, so if you have one of these ovens and your pizza is bad, don’t blame the oven, blame the cook. A good outdoor pizza oven provides even heat, it can be fired with any combustible, and it must be sufficiently thermally insulated to protect everyone around. The final issue is size; mobile ones can be transported anywhere by car and with ease. In essence, what we common chefs and cooks and home cooks like to talk about is Fahrenheit and Celsius. So, when you see an advert stating 60,000 BTU, it just means that they are trying to sound ever so posh and clever, and forget that we cook with simple numbers, not scientific models. So, please excuse me when I disregard BTU’s in my review, I stick to the basics, hot, cold and Fahrenheit (or Celsius). 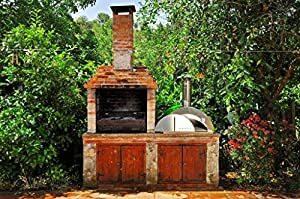 OK, Nuff said, now let’s get down to the real deal, the best outdoor pizza ovens you can buy online. 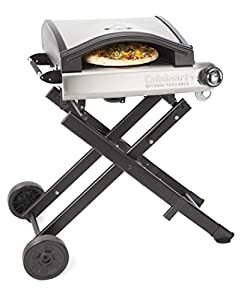 Pizzacraft has made a great line of outdoor portable pizza ovens, and this is one of their sturdier models. It cooks one pizza at a time and when set properly, will churn the pizza out in 5 minutes. This oven can reach 700oF and can manage 2 hours of constant cooking using only a 1Lb propane gas tank. You can calculate how many pizzas you can churn out; it’s virtually a pizza shop. The Pizzeria Pronto oven comes with an interlocking cordierite pizza stone and a heat-diffusing hollow core in a reflective heat shield body that makes sure the heat is even all around the bake. The moisture vent at the top of the oven releases steam, reducing sogginess and providing a good, generous crispy crust every time. The oven takes 10 minutes to pre-heat and is light, portable and perfect for patio’s, parties and those camping trips where you prefer to shoot the game with a camera, not hunt and grill it. I’m back with another great Pizzacraft oven, this time it’s their PizzaQue model. This model is a smaller one than their Pronto model but provides the same quality results. 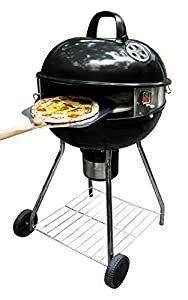 The main difference here is that this model connects to a 20Lb propane tank and provides up to 25 hours of uninterrupted pizza cooking. Now, unless you are opening a shop in the Grand Canyon, I doubt if you need to work 24 hours to bake. However, with one big propane tank and one great pizza oven, you will most probably use it over 12 months. The Pizzeria PizzaQue oven comes with an interlocking cordierite pizza stone and a heat-diffusing hollow core in a reflective heat shield body that makes sure the heat is even all around the bake. The moisture vent at the top of the oven releases steam, reducing sogginess and providing a good, generous crispy crust every time. This oven is a convection conduction model and uses reflected heat to create an even burn all around. The average time it takes to cook a pizza is 5 minutes, and this little demon weighs less than 40Lbs. When folded this oven comes with its own roll away cart, and you can cook more than pizza in it, you can bake any kind of flatbread too. A quick guide to how it works, the convection process pumps heat around the domed liner, creating a pocket of air that rejects moisture accumulating. The cordierite pizza stone spreads conduct the heat evenly through the base, and the reflected heat maintains a burning sear that finishes the cook in 5 minutes. All in all, a great oven, and a good buy. This is a great small outdoor pizza oven, weighing in at 47bs and providing 700oF of propane gas heat. The Camp Chef Italia is truly perfect for those trips into the wild, or just outdoors when guests come for a great party. Basically, when you have a barbeque, have one of these too. This model heats up in 15 minutes and has a heat adjust knob that lets you control the temperature. Once you get the hang of perfect pizza baking, this unit will produce quick and tasty pizzas every time. It’s time to talk Uuni, and when you do, you never talk another language again. The Unni is a modern Scandinavian design that burns wood pellets, so you get even more portability and its lightweight, only 29Lbs makes it one of the lightest portable outdoor pizza ovens around. What is even more amazing about this model is that it can reach up to 932°F in 10 minutes, which shows how efficient it manages the heat from the pellets. Now let’s take a closer look at this little beast, and a beast it is. It outperforms most other models in heat levels and heat control. It is cheaper than a propane model, and when you run out of gas in a propane model, you don’t have an oven. This one burns wood pellets, and in the worst-case scenario, wood. So, essentially, when you run out of pellets, you can still use it. Bottom Line, and I don’t bottom line a lot of the ovens here, this is one heck of an oven and well worth the investment. Light, hot and fast, as well as reliable. OMG. This is an indoor and outdoor pizza oven. It’s a countertop model which means is not really good for campsites unless you have a suitable electricity source. This one is powered by a standard 110V outlet. So basically, its used in the house and on the patio. Now let’s look at what it can do. The unit comes with dual heating elements, so your backing stone gets heat from two sides, this produces an even flow of heat that doesn’t burn one area. You get temperatures reaching 660°F, and it does cook a pizza in 6 minutes, tested and proven. 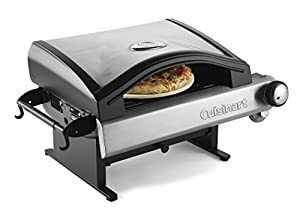 The upside of this unit is that it’s like a toaster grill, just pop the pizza in, close the lid, count to 6 minutes, pop the lid, and pull the pizza out. There are portable outdoor units and standing outdoor units; I always think this of a standing one, not one I would cart around to campsites. This is backed up b the fact that it weighs in over 100Lbs, not something you would want to lug about. The design is solid and sturdy and is powered by propane. This model comes with electric ignition, so you don’t need to fiddle about, just open the bottle of gas and hit the switch. It’s also large enough to bake a 16” pizza, and it does so in 3 minutes. Got that, 3 minutes! What this means is that you get to eat the pizza you bake before everyone else gobbles it up while you are standing there baking. The reason this unit is so fast is that it has a rotating bed, which adds to the convicted heat build up and speeds up the process even if the heat is all the way up to 700oF. Another bottom liner here, this is a great outdoor sturdy model which you leave outside on your patio, just make sure its secured for all weathers or packed up when not in use. The ilFornino® Professional Series pizza oven is an outdoor (not so portable model) weighing in at 280Lbs; you are getting a very professional solid wood burning pizza oven. Now down to the good stuff. This looks good, feels good and cooks better. It’s not a fast oven; you need to stoke it well, light it up and wait for the heat to build up. While it can reach over 600oF inside, the outside remains cool, so if you inadvertently touch the sides, you don’t get burnt. The inside is made of 2 layers of refractory ceramic fiber blankets ad the walls are 430 Stainless Steel. The base or floor of the furnace is made of 1 ½” thick refractory pizza stone. Once this beast is up and running pizza will take around 70 seconds to prepare, push one in, turn it around, pull it out, and start again. 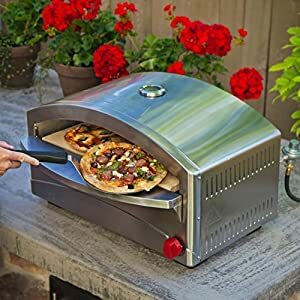 I suggest you learn how to cook a pizza first before trying out one of these models, however, if you are even a newbie and intend to cook pizzas outdoors, buy this, set it up and enjoy it for a long time. This model is weatherproof. However, I do suggest covering it in the winter. Its time for Pizza again, and just like its elder brother, the 640, nothing states portable outdoor pizza baking more than a Cuisinart CPO-6O0 Alfrescamore, which is Italian for “for the love of the outside.” This oven is a convection conduction model and uses reflected heat to create an even burn all around. The average time it takes to cook a pizza is 5 minutes, and this little demon weighs less than 40Lbs. If its outdoor pizza ovens with Italian design for flair, then the Forno Bello will blow you away. Just like the magnificent sports cars of Italy, this is a design for love affair, a love affair with a pizza oven. This oven is a backyard standing oven that weighs in at 275Lbs, is wood fired and can reach a temperature of over 600oF. It’s a classic brick oven design with a stainless-steel body coated with a thermal insulating ceramic blanket material, and the floor is a traditional refractory brick. It takes around 15 minutes to heat up, but once it does, you can fire out pizzas one every 70 seconds and just keep them coming from a professional pizza shop. The only initial downside I have to state about this product is that it comes disassembled. Yup, you heard me, you have to assemble it. However, if you were to by a Ferrari and had a chance of buying it disassembled, I assure you would jump at the chance of handling every spectacular hand-crafted part. What better way to learn about your oven, then to build it yourself. If it’s fast and furious you want, then you must get the Mont Alpi tabletop pizza oven. This is a portable model weighing in at 30Lbs and connects to a 1Lb or 20LB propane gas bottle. It takes five minutes to heat up to 620oF, and it is big enough to cook a chicken as well as a pizza. 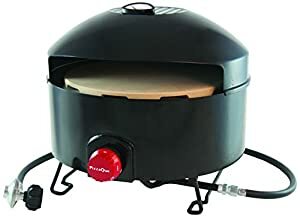 This is a great oven solution beyond pizza and is a must for all camp trips that want diversity. 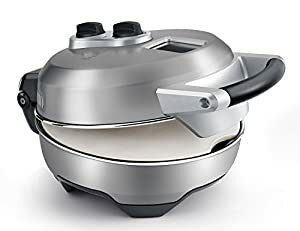 It comes with a pull-out fat tray, so you can constantly reduce the smoke level unless you want the smoke for cooking purposes. Bottom Line, yup, this is a bottom liner, I like this oven because of its diverse and cook’s pizzas as well as meats. However, a traditional pizza cook will not stoop to such common practices and will always use the oven to cook pizza first, and only after that meat. You don’t want the fat and steam to ruin the flavor and texture of the dough. This isn’t really a pizza oven; it’s a pizza oven kit that can convert your standard kettle grill into a pizza oven. This is a neat little trick if you are a standard home cook and not interested in having a special oven just for pizzas. OK, it’s a PizzaQue accessory, so it works, it’s not a gimmick. What happens is that this kit, when added to your kettle grill will produce heat in excess of 850oF, which is more than enough for any pizza. OK, so how does it work. Well for starters it keeps your money in your wallet, so that’s a good start. T also helps you learn how to bake pizzas in an economic environment. 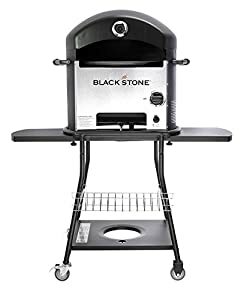 After you have stocked up the fire, from charcoal, wood, or pellets, you assemble the base holder, place the pizza stone on the base holders, close the lid and wait for 10 minutes while it heats up. Then open the lid, place the pizza on the stone, close the lid and wait for five minutes. It’s simple, and after a while, you will get the hang of cooking pizzas. 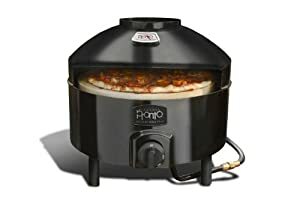 This is a great starter kit for novices, and after you have passed the grade, which is baking a perfect pizza all the time, you can consider breaking the bank and investing in a real pizza oven. Now for the trade secret, did you know that there is nothing like a real pizza oven? Well, its true, pizzas can be baked anywhere, it’s all about knowing how to bake them and getting the best result. In the end, it’s not the oven or the ingredients; it’s the cook that counts. The Nonno Peppe is an Italian made stainless steel wood fire oven. Its beautifully compact and portable, and as such can provide any pizza cook with a perfect solution in any situation. All you need to do is fill it with wood, allow it to heat up to its 300oC in 5 minutes. Yup, you heard me, 5 minutes and its ready to bake its first pizza. Why is it so fast? Ah, well that’s because it is designed to be extremely compact, allowing the heat to accumulate in a compact area, focusing it evenly on the pizza oven bed, which is made of terracotta ceramics, makes for fast heat and an even faster bake. Now, in essence, you wouldn’t really start a bake at such a temperature, you would wait for the full 15 to 20 minutes so that the heat is infused properly and that way you bake a pizza in two minutes. 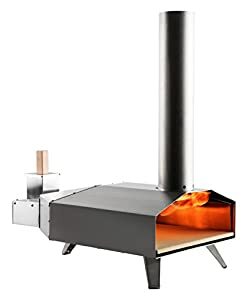 I have to tell you if you want a no-nonsense pizza oven that looks really impressive and can be taken on camping trips too, invests in this one., it’s worth it. It’s time to present a really solid outdoor all-weather pizza oven that looks the part, old, rustic and reliable. 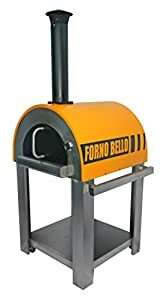 This is a Portuguese pizza oven, you might ask what Portuguese has got to do with anything Pizza, and you would be right in asking so. The answer is simple, nothing. Its just a name for an oven design originated in Portugal that was used for cooking and baking and is now good for pizzas too. In fact, if you intend to invest in a solid outdoor pizza oven, you might consider the PRC design as a better option than post. This oven will allow you to cook meat and poultry as well. Here is what is so special about the Portuguese oven. The door is 20” wide, it can reach up to 900oF inside, and the flooring material is firebrick, not standard ceramics. The arch is also made of brick, and the inside lining is covered with a ceramic fiber blanket. All of this in a solid design that weighs a total of, wait for it, 1,200Lbs. Yes, a ton! OMG, the hulk of pizza ovens. 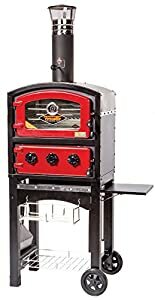 OK, here goes, the bottom line coming, this is only for serious pizza outdoor cooks that want to complement their barbeque grills with a professional outdoor oven. However, here is the killer, its cheap! Yes, its budget-friendly, well, its budget-friendly if you compare it to other professional pizza ovens. I close this review with the Alfresco Home Fornetto model. 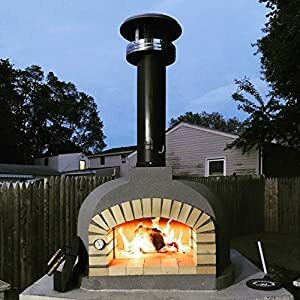 This beautifully designed outdoor pizza oven. Is actually a hybrid oven, that cooks anything and everything It can reach temperatures of 662oF and weighs 213Lbs, that is why it comes on wheels. The reason this model is considered to be a pizza oven is that it comes with a pizza oven stone that will sit on the brick floor. 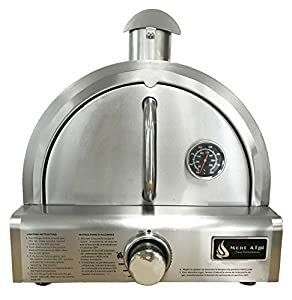 I will not delve too deeply into this ovens capabilities, just to state that it comes with a smoker unit, so if you are an outdoor cook looking for something a little extra, this is the one to get. Let’s start off by stating that I tested all models that fell within a specific range of prices. There is no point in comparing a top range item that costs thousands of dollars against a simple unit that costs a few hundred bucks. However, I will state a claim that I added one non-pizza oven unit, a pizza oven accessory unit that adds to a standard barbeque and compared it to the rest. The reason I did this was to facilitate newbies that want to get into the scene as well as professionals that are seeking an alternative to the model they currently have. The bottom line of the bottom line is that all the ovens that reached this review passed the basic skills test, a novice was able to operate the unit from scratch, and a professional produced perfect pizza every time. The difference in models was anticipated, and the review covers portable and non-portable models that all produce similar results within their categories range. Deck Ovens – these are the modernized equivalents of brick ovens, they provide experienced chefs with greater control over the types of pizza they want to cook. Brick Ovens – these are the original pizza ovens that are heavy, reliable and produce the best results. They are not usually portable and are the most beautiful in design. A really well-designed brick oven will keep the customers in awe. Revolving Tray Ovens – these are usually found in the home, like countertop units. They are small and compact and turn the pizza so that it receives a more even heat from the heating source. Conveyor and Convection Ovens – these are commercial ovens found in fast food chains, they process a processed pizza within 5 to 10 minutes, and all the pizza shop does is place the order on one side and waits for it to “drop” off the other side. When purchasing a pizza oven, keep these factors in mind. Outdoor pizza ovens are distinguished by their curved domes that help spread heat evenly and maintain high temperatures. This design also helps the outside of the oven not to get too hot. When choosing pizza oven, choose ones with a refractory oven floor. This helps bounce heat back up into the top of the oven so that you’ll be able to create crisp-crust pizzas. Basically, there are a few fuel types; these include wood, wood pellets, charcoal, propane, and electricity. The professional pizza chefs will all swear by wood, and yes, this does provide great results. However, the experienced pizza maker doesn’t contain him/herself to any one type and concentrates on end results, not the process. Location is the most important factor in deciding whether you want a portable unit or a standing unit. A portable unit is to be sued for camping, may be moved about outdoors, maybe even used indoors. The place you decide to cook your pizza will define what model you want. The budget will define what model you can afford. Available Space, this is a subset of outdoor/indoor placing. If your patio is small, then you want a small outdoor unit, if you have a large backyard, then you might prefer to go for a bigger brick oven. If it’s indoors, you need an indoor oven. However, the bigger houses can afford to have a brick oven installed indoors as well. Bottom line: the budget is key to deciding what you can afford to buy versus what you can install. Make sure that the cooking surface of your surrounding area is large enough to handle the pizza cooking process. You need to be able to slide a pizza in and slide one out without having to step all over the place. Basic ergonomics. If your location is small, set everything up, so you have a left and a right surface. Once side for preparation, the other for the cooked product. The bets ovens are made of the best materials. We can argue all day about ceramics. However, the bottom line is which brand are you buying. If you buy from an unknown source, you take the risk of buying fake materials that crack and burn. Don’t buy something that comes from an unknown source, stick to brand names. The design is actually more important than you realize. The aesthetic to the eye is of high value when preparing a pizza. The impatience of waiting for a good pizza is impacted and multiplied when the oven looks like it can produce magical pizzas even without experience. Size, this is a subset of design. Make sure you buy a unit that fits into tour surroundings, There is no point in buying the best-designed pizza oven if it takes up all your backyard. The closing clincher, like I started with. There is no replacing experience; you can buy the best pizza oven in the world, if you don’t know how to prepare and bake the pizza, you will not get pizza. So please experiment at home with your oven, and after you can produce some stunning homemade pizzas, go out and buy the best unit in the world.